So, it’s that time of the year again…ski season!!!! You really don’t need more than one set as these days, thermals use an anti-odor technology which keeps your base layer fresher, longer. Besides, if you need to wash them, they should dry overnight. Thermals work by moving moisture away from the body, keeping you dry and warm. If you’re renting boots, I would suggest a slightly thicker sock. But if you have your own boots, a thin wool sock is highly recommended (see the Euro sock – a personal favorite). If you’re skiing on the West Coast of the US (Utah/Colorado), it’s unlikely you’ll be skiing in rain. Snow hopefully but the snow on the West Coast is very dry, so a pair of pants that are water resistant are a safe bet. Columbia jackets are great for travelling because a many of their jackets have an “inner” down jacket which is very lite but insulated and which you can also use when you’re not skiing. The waterproof and windproof shell can be packed and you can wear it over the top of the inner jacket when you’re skiing. This saves on space. Just take two, preferably in different colors so you don’t look like you’re wearing the same top every day. For very cold days, a fleece or merino wool sweater are the best. But the key is to LAYER! Skboot is all about safety and we are huge advocates of the ski helmet. If you don’t have one, do yourself a favor and get one. All ski helmets have to meet the same safety requirements, so it doesn’t matter if you spend $70 or $700, they are well worth the investment. I can’t tell you the number of times I’ve heard of people who have fallen and have been saved by their helmet. They are light to wear and keep your ears warmer than any beanie. Then, of course, if you want added warmth and protection, we highly recommend Skboot’s latest and newest must have ski accessory, The Neoprene Helmet Glove (NHG). You’ll need a neck warmer – the turtle fur ones are really snugly, a good pair of ski gloves or mittens (some now have zippered compartments on them for hand warmers) and goggles. Mittens are the favorite with seasoned skiers. I was told a long time ago that if you ski, skis you can rent, but to ski well, you need your own ski boots. 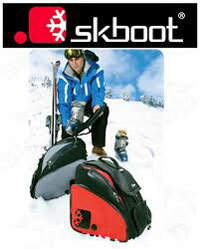 If you have your own boots, you’ll need an awesome bag to pack your ski gear in : the SKBoot bag is an up-scale and very stylish ski boot bag on wheels that fits your boots, helmet and gear – perfect for the skier or snowboarder who travels to ski. See our latest video which shows you some TIPS and TRICKS on how to pack your SkBoot bag. The idea of this wheeled ski boot bag was that you can pack ALL your ski gear in one bag, check that bag, and then carry a smaller bag as carry-on if you like with your other clothing. For skiers and snowboarders looking for backpack solutions to stay organized and make going from the parking lot to the lodge and back again a snap, we’ve found a very clever set of bags developed by another small company in MA called Kulkea. Their packs are designed specifically for recreational skiers and families to take the schlep out of skiing through innovative functions and features that make everything easily accessible and as hassle free as possible. For children, a great company out of Colorado (Kinderlift) make fabulous ski and boot bags for the little ones! 2-4 sweaters or shirts for the evening. Remember, accessories can make the same outfit look totally different. Accessories such as a scarf, beanie and gloves. A pair of skinny jeans. Dark blue or black pants are the best, as they will go with anything. Boots. Peta has a beautiful pair of black patent leather boots which she also wears to travel in that have a nice low heel, but look very dressy. Also take a pair of après ski boots that you can slip on after a long day of skiing. If anyone else has any other suggestions, please feel free to add them to our comments as we’d love to get your input.